Sushi Go! The most played game at the club this year and all-time. This year we played 390 games slightly down on last years’ 448, however we only had one Saturday event in 2018 which may have had a slight impact. Only 79 of the 248 titles played this year had multiple appearances leaving 169 titles with only 1 play (68.14%), this is a bit sad and I wonder if we are forever chasing flavour of the week or are most games just not reaching a high enough standard to deserve a replay? I also wonder whether this is also reflected in the games we buy for play at home. A stack of 26 games, so a stack of 248 (the number of different titles played) would be nearly 10 times this amount, quite a bit of shelving space. Top of the chart this year was Sushi Go! with 8 plays, following were Fuji Flush & Istanbul The Dice Game (7 plays); Bruges & Cafe Fatal (6 plays); Majesty For the Realm, Capital & Bunny Kingdom (5 plays); 7 Wonders, Reef, Flamme Rouge, Om Nom Nom & The Quest for El Dorado (4 plays). Om Nom Nom had a repeat appearance in the annual top games played at the club, a typical lightweight filler with simple rules, engaging and an excellent intro game for non-gamers. Only 4 of these games Sushi Go!, Capital, Flamme Rouge and Fuji Flush appeared in the top plays list for 2017. The clubs favourite game has to be Sushi Go! as it is the third year in which it has appeared in 1st or 2nd place. Cockroach Poker in 2nd place of most played games at the club. The full Tally at the club since we started on 23rd April 2014 is 1871 games, this does not include games which have multiple plays at the same or a different table on the same night, so the true sum is quite a bit higher. 733 Unique titles have been played with of course Sushi Go! standing out as the most played game with 34 plays, following are Cockroach Poker (21), Bang the Dice Game (20), Port Royal (20), Splendor (18) and Fuji Flush (17); it is not surprising that these are the most played as they are regular filler games at the club, the more substantial games have a lot fewer plays and it depends on your perspective as to what that includes, as examples we have Flamme Rouge and Traders of Osaka with 12 plays a piece, Russian Railroads at 9 and Concordia at 8 plays. I am hoping to catch a few of you out with this quiz picture. The last quiz picture was Seikatsu an excellent and beautifully made game which is superb and well balanced for 2 or 3 players. I know it has been far too long since the last post, personal circumstances have left me no time to do the blog at the moment so it has lain dormant. I will try to get things going again but please do not expect anything more regularly than monthly updates, but they will contain a short review or two of the latest or my favourite games. The Essen games have now started to reach the UK, last week Altiplano was played which received good cheers, other Essen releases which have been played are Agra, Merlin and Tiefe Tasche. I am hopeful that Azul and Civilization Tribes will reach the tables this coming week. As you can guess there have been a lot of games played since I last blogged and I have listed them all below but I have avoided putting in the actual geek links however if you want to know anything more about any of these games you can go straight to the geek and input the game name there. Please note that the 8th October was a day event, the games listed were played across the many tables that were running. Table 3 - Discoveries, Livingstone. Scroop, Inis, Duel of Ages II, Captain Sonar, Burg Flattestein, Deep Sea Adventure, Secret Hitler (x2), Fuji Flush, Sushi Go Party, 8 Minute Empire Legends, Seven Wonders, Secrets, Set, Battlecon : Devastation of Indines, Cottage Garden, Bang the Dice Game, Robinson Crusoe, Sagradas, A Game of Thrones, Anachrony, Galopp Royal, Kwiiietsch (x2), Bang the Dice Game, Insider, Ladies and Gentlemen, City of Horror, One Night Ultimate Werewolf. Table 1 - Keyflower, Ghostel, Isle of Skye. The quiz picture this time is of a new game that has some lovely pieces. The last quiz picture was not guessed at all, it was a pizza slice from Macroscope, the game is about identifying a hidden picture, the pizza slice is the example in the rules and is the picture used when explaining to others how to play. Now onto the last 3 weeks of game. Secret Hitler - The policies begin to mount up but not in the facists favour. Table 2 - Diamant, Secret Hitlerx2, 6 nimmt! Terraforming Mars has been getting a lot of favourable press and I have to agree that it is a very interesting game and one that I have become quite fond of. The basic idea is that players are corporations who have been charged with Terraforming the planet Mars, in doing so they collect victory points from various sources and the player with the most points at games end wins. 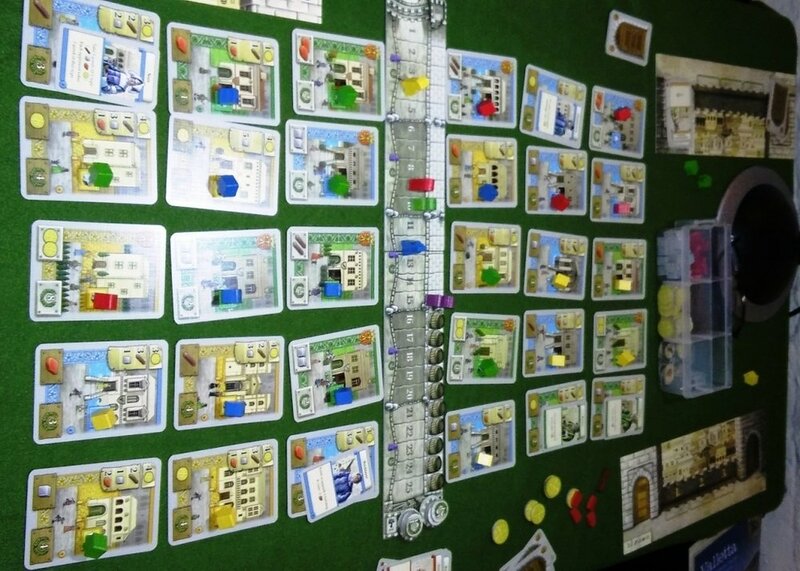 The players each receive a corporation board on which they record their production ability of cash, steel, titanium, plant growth, energy and heat, the player board also records the players stored resources of these six items. The game board consists of one face of the planet Mars upon which the players place hexagonal tiles as they terraform it and three gauges, the first is the temperature of the planet starting at -30 degrees, the oxygen level, starting at zero and the players terraform rating which doubles as victory points and part of their corporations cash income. The driving mechanism of the game is a large deck of cards (I will come to them last of all) which are used to obtain resources and set up “victory point engines”, at the start of every round players are dealt 4 cards of which they may keep or discard as many as they wish, then players take turns to take 2 actions, however the players keep taking turns of 2 actions until everyone has passed, after this everyone produces and a new round starts. The game ends when all sea tiles have been played and the oxygen and temperature scales have maxed out, players continue taking actions but that becomes the final round. Taking a round in a little more detail players are dealt 4 cards, they may keep as many as they like but each card kept costs 3 cash, as income at the start of the game is only 20 per turn initial choices of the correct cards is tough and taking them all will leave you hardly any cash to take actions. The choices of actions are numerous, and the possibilities provided by the cards are many-fold, however amongst them a player may take any basic action which consists of raising your energy production by 1 which costs 11, place a forest tile which costs 18, place an Ocean tile costing 20 or place a city tile which costs 25, when placing a tile players collect resources as printed on the board of the space they cover, if they place a forest they also raise the oxygen 1 step and move their TR rating up 1 on the score track (the knock on effect of a TR rise of 1 is 1 extra cash income too), placing any tile next to an Ocean gets you 2 cash straight away, another 2 actions you can take is to spend 8 heat cubes and raise the temperature 1 step (which also raises your TR 1 step) or spend 8 cubes from the plant growth box on your player board to place a forest tile with all the gains that may provide. You may also for an action take an action on a previously played action card in your display, which now brings us to the cards. The cards (of which there are 208) come in 3 different colours, there are Red one use instant effect cards which after using are placed face down in front of you, there are Green one use instant effect cards which remain face up in front of you and Blue cards which need to remain open face up in front of you as they will either give on ongoing effect throughout the rest of the game or contain an action which you may use once per game round (of which there is usually between 10 and 12 in a 2 or 3 player game). Most (but not all) of the cards come with some circle tags at the tops of the cards, these are important as they provide triggers and knock on effects for cards you may collect later in the game and it is finding and playing a working combination that will gain you extra points at the end of the game, for instance there are several cards which give points for Jovian tags, unfortunately some cards need pre-requisites before they can be played for example oxygen level minimum 4% or needing three science tags in play however it is the cash cost to play the cards that can cause the biggest problems, at the start of the game after paying 3 cash for each card you keep you are usually left with enough to pay to put only one or two cards into play, on the plus side though steel can be used as a 2 cash subsidy for cards with a building tag whilst titanium gives a 3 discount on playing cards with a stellar tag so increasing your mining abilities can be quite beneficial. The green cards are kept face up for their tags only, however the blue ones can give some interesting benefits from a discount on every future card played, discounts for certain tags to collecting microbes or animals for extra points at the end of the game, however most cards rely to a certain degree on you receiving the correct cards in later deals to augment this benefit, in one game I started with a stock of 10 titanium, however it was 6 turns into the game before I received my second stellar card, and in another I was waiting for 3 science tags to put other cards into play and did not draw a single card with such a tag, both these situations were frustrating and the first was game losing. I have not covered the last 2 actions you may take which is to buy a milestone or fund an award, the milestones give 5 points to the player who fulfils the requirements and claims them (only 3 of the five can be claimed) whilst the rewards give 5 points for whoever fulfils them at the end of the game, again only 3 can be sponsored. Terraforming Mars is an excellent game, it has a nice mix of set collecting, area control and resource management. Plenty of thought and (to a certain degree) calculation is required in every turn add to that some long term planning, a need to balance resources and expenditure whilst also fighting the tempatation to buy every card that comes your way and you have a cracking game. I have enjoyed it immensely every time i have played, even those that went horribly wrong for me and in my opinion this should be the next Kennerspiele prize winner. A Great White Egret photographed at at Dungeness - a rare visitor to this country. The quiz picture this time is of a new game that I found out about just before last years Essen, it was on my wants list for 9 months before I got hold of a copy a few weeks ago. The last quiz picture was correctly guessed as Duck Duck Go which has similarities to Roborally but with less control and no lasers but you do get to play with a plethora of different rubber ducks and it has a nice fun element which RR lacks, I have about 25 ducks some of which were plain yellow ducks which we painted ourselves. A Galaxy Trucker - Not the fastest ship with 5 speed but plenty of cargo space. Table 4 - Blood Rage, Caverna: The Cave Farmers. Vast the Crystal Caverns - again I have not played but sounded very interesting with players chasing different goals and one of them playing a Cave (yes a cave that is a hole in a cliff side). Table 1 - Euphoria: Build a Better Dystopia, Flamme Rouge, Dominion, Sushi Go! Table 4 - Vast: The Crystal Caverns. Round House is a resource management game, based on large clan houses in the Mountains of China players move one of 2 pawns clockwise round the board which consists of 2 circles of rooms with steps in some places linking the two circles. The rooms are placed at random at the beginning of the game so each game can have a different layout. The pawns can move up to 3 spaces and leapfrog other players pawns on the board so can circuit quite quickly in a 4 player game, however as each player has 2 pawns it is possible for a space to be locked out for some time due to another player just sitting on it. With the actions players may collect cards, money, goods, they may be called on to spend money on actions, they may place helpers adjacent to an inner circle room or they may go trading. The trading action allows players to place a family counter in one of four villages whilst helpers on inner circle spaces allow you to double up on an action when you land there. The importance of occupying villages is realised when one of your pawns completes a circuit at this point you may empty a village of your counters and place them on a grid to collect victory points an in-game bonuses, the game ends when a set number of these scorings has taken place based on the number of players. Having played it twice I have been impressed by how balanced the game is there are many ways to collect points and none seem any more powerful than the others, I was reminded of a Michael Schacht game in that there were many things you could do and there were lots of actions to take to build up to a point gathering action however it is no copy and stands on its own as a lovely game. Flamme Rouge is a cycling game and according to those who have experience of cycling accurately reflects the sport. The game consists of a number of linked track pieces each 2 spaces wide connected together to form a set course and a race is completed from one end to the other. Each player gets two cyclists and a deck of cards for each of them the two decks differ slightly for the sprinter and the climber. On a turn you choose one of your cyclists and select a card from a hand of 4, the remaining 3 cards are placed at the bottom of the deck then you do the same for your other cyclist. Once everyone has selected their cards they are revealed and movement completed for each cyclist starting with the race leader. Pieces can move through other cyclists but not stop on the same space and after movement has been completed slipstreaming occurs starting from the back group/cyclist, provided they are no more than 1 clear space behind the cyclist in front, they catch up then the gap is checked with the next group and so on until all groups have been checked for slipstreaming, the cyclists which are leading each group get a penalty move 2 card which is added to the bottom of their deck (headwind) which effectively become deck cloggers but can be used on hills, added problems are caused by up-hills where no slipstreaming can occur and any points over 5 on a card are lost if any part of the move is on an uphill slope, there is a bonus on down hills in that any card provides a minimum movement of 5. Overall it is a pleasant game but not one I would choose to play, for me it is too pedestrian and requires minimal thought each turn however I am told by those that love the game that it is a lot deeper planning the race is important, I just do not see it myself but there are games I adore that others do not see the point of, it is all a matter of personal taste. I have gone for something less dramatic this time, the three on the left are official the three on the right are not. See if you can find the game without googling/bgg searching the word “Duck”, cryptic answers only please this time, non-cryptic after Friday or ask me at the club. The last quiz picture was correctly guessed as Nuclear war which if I remember correctly got heavily criticised by one of the national newspapers many many years ago as glorifying nuclear war obviously by someone who did not have a clue what it was about. A nice game but with a high luck factor though this can be mitigated by a simple rule change. Sushi Go! - not a high score here. Table 1 - Scythe, Sushi Go! The spotlight again falls on something fun, I have chosen Catch the Moon an interesting balancing game that I came across recently. The box contains a plastic base in the shape of a cloud and a large number of wooden ladders with side rails and steps at all sorts of angles (some even with broken steps), a dice and a number of wooden teardrops. Three of the ladders are straight and true, two of those are inserted into the base to start the game, the third ladder joins the others to create a random draw pile. On a turn a player rolls the dice takes a random ladder and attaches it to the ladder(s) already in play, a placed ladder must follow the directions of the dice, which are that it can only touch one ladder, it can only touch two ladders or that it must create the highest point (touching only one or two other ladders). If in placing a ladder any ladder falls or touches the base or ground you collect a wooden teardrop and your turn ends immediately all fallen ladders and your own if unplaced being discarded from the game, the player who has the least teardrops when the last ladder has been used from the stock wins. The concept is simple and the game has similarities to other balancing games in that you take a piece and add it to the stack, however the lightness of the ladders and the strictures on how many other ladders it may touch makes the balancing more tricky than in other games of this nature, the delicate balance reminded me of an old game I had as kid called Vertigo where even the weight of a small piece of paper would change the structures appearance and its integrity, however the ladder pieces themselves are quite robust, another nice aspect is that despite the appearance of them easily interlocking it is often awkward finding the ideal spot to balance the ladder, the game can be made easier by placing the starting ladders closer together thus making for a firmer base for the central structure. Overall I like the game, it may not be as silly as Rhino Hero or as structured as Junk Art but it has its own beauty and plays simply and quickly and I have certainly had pleasure from playing it.